INSPIRED DISNEY BAMBI Design ⭐. 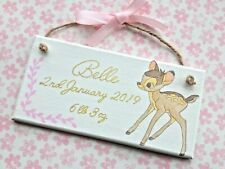 Hand painted sign, decoupaged Bambi finished with a pink ribbon and jute string for hanging. A Boy version of this plaque also available, with blue trellis and ribbon. Inspirational quote Plaque Decoration. Black dotty ribbon and a little star attached. White base with picture printed front Black text. Cute Llama Picture Holders Fun Room Decore . Condition is Used. Dispatched with Royal Mail 2nd Class. Bought for £15 selling for £5 , £10 off !! 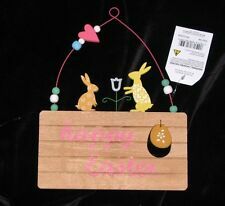 BUNNY DECOR ON TOP OF SIGN IN YELLOWS FACING FLOWER. HAPPY EASTER SIGN. SIGN IS NATURAL COLOURED WITH SMALL INSET YELLOW EGG. WOOD SIGN SIZE 17 CM X 9 CM. New listingCHAMPION HEREFORD BULL 1889 WOODEN WALL PLAQUE HANDCRAFTED. You Will Get The Above Plaque In The Picture. DECORATIVE/NOVELTY PLAQUE'S. ((Hand made novelty gifts))Top Quality. THE PRODUCT YOU RECIEVE WILL BE AS THE PICTURE SHOWN ABOVE, INCLUDING ANY MARKS THAT YOU MAY SEE. Prosecco Plaque Decoration. House runs on love laughter and prosecco. A great plaque to give to a friend. with little diamante detail black dotty ribbon bow. A perfect gift for all year round. This can be caused by many factors such as the brightness and contrast settings of your monitor. Inspirational quote Plaque Decoration. White base with picture printed front Black text. Wedding Plaque Decoration. cream ribbon and 2 little pearl hearts attached. White base with picture printed front Black text. Unicorn Hanging Sign. Off My Unicorn". Board Size Approx. 30 x 20 x 1 cm. Personalised Handmade Wooden Door Plaque/Sign. FOX Design ⭐. Hand painted sign, finished with a gingham ribbon, wooden button and jute string for hanging. Would make a lovely gift ! 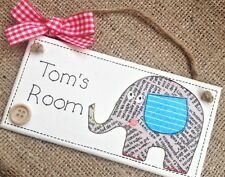 Personalised Handmade Wooden Boys Or Girls Door Plaque/Sign. Would make a lovely gift or a perfect addition to your child's room. Red ribbon bow also available. Hand painted sign, decoupaged lion finished with a gingham ribbon, wooden button and jute string for hanging. Wedding Plaque Decoration. cream ribbon and 2 little pearl hearts attached. Size 12 x 20cm. BNWT Hanging Owl Wooden Floral Love Ornament Plaque Decoration. A really lovely sentimental plaque. This is new with tags, but does have a little smudge to the front probably from shop storage, as photos clearly show. From a pet and smoke free home too. INSPIRED DISNEY BAMBI Design ⭐. Hand painted delicate pink sign, decoupaged Bambi finished with apink ribbon and jute string for hanging. Would make a lovely gift or a perfect addition to your child's room. Not mass-produced so each piece is different and authentic. We can change all the words - just ask. Drill holes can be either top corners or mid-sides unless requested elsewhere. Prosecco Plaque Decoration. House runs on love laughter and prosecco. with little diamante detail black dotty ribbon bow. A great plaque to give to a friend. Base painted white with picture printed front. Personalised Handmade Wooden Boys Or Girls Door Plaque/Sign. Would make a lovely gift or a perfect addition to your child's room. Blue gingham ribbon bow also available. Hand painted sign, decoupaged lion finished with a gingham ribbon, wooden button and jute string for hanging. Wire Haired Fox Terrier Sign. Great gift for any Fox Terrier lover! Personalised text:-. Beautifully engraved chopping board (to depth 1.5 - 2mm) into quality sustainable bamboo wood. If we do not receive instructions on checkout a default "Daughter engraving" as advert, will be produced. Lovely wooden hanging picture handmade Decoupage Shabby Chic Love Birds budgies, blossom trees. This is a handmade product, a MDF plaque - flat picture with decoupage technique (a paper napkin glued on a MDF plaque), finished varnish, non toxic and acid free glue and varnish, border painted with acrylic paint, a plaque is painted with white water based undercoat paint and water based white gloss paint on the back. With intricate detailing and an uplifting quote, this heart shaped plaque is a favourite! Made from plywood, it features the quote 'Leave room in your garden for fairies to dance'. With a shabby chic teal finish, what makes this decoration extra special is the two wooden fairy silhouettes on either side of the heart. Made by Precious Pets, Splosh. Cat sign with rope loop on back of sign for hanging. DOG WALL PLAQUE. DOG HAIR DONT CARE. Hand made. Hung with jute rope. Dog Themed Plaque, Dogs Leave Paw Prints on Your Heart. Cat Print Engraved Rolling Pin. Handmade. New! Different designs available! NICE SOLID COUNTRY KITCHEN OVAL PIGGY WALL PLAQUE - CUTE - 15 1/2" X 11 1/4"